The extracellular volume fraction (ECV) by T1 mapping measures the size of the myocardial interstitium. T1 changes in blood and myocardium are used to measure the contrast partition coefficient (λ), and substituting in the blood volume of distribution (directly measured on a peripheral blood sample as one minus the hematocrit [Hct]) provides the ECV. This methodology is however cumbersome, has significant variability, introduces a delay and is a barrier to wider use of ECV quantification in clinical practice. We have previously observed a strong relationship between ShMOLLI T1blood and Hct [Piechnik, JCMR 2013, 15:13] and hypothesise that this could be used to infer the Hct at the time of scan and permit immediate ECV calculation without blood sampling (ECVNo Hct). 350 subjects (age 61±15 years; 47% male; 36 healthy volunteers, 95 severe aortic stenosis, 95 with a history of anthracycline chemotherapy, 46 hypertrophic cardiomyopathy, and 78 cardiac amyloidosis) underwent T1 mapping with ShMOLLI at 1.5T (Siemens Avanto) prior to and at 15 minutes after administration of 0.1mmol/kg of Dotarem. Venous blood for Hct was obtained prior to scanning. The partition coefficient λ = (Δ[1/T1myo] / Δ[1/T1blood]) and ECVHct = λ * [1-haematocrit]) were calculated. Hct was approximated from the linear relationship with native T1blood and used to calculate ECVNo Hct. This was then compared to the conventional ECVHct, partition coefficient and post-contrast T1myocardium. 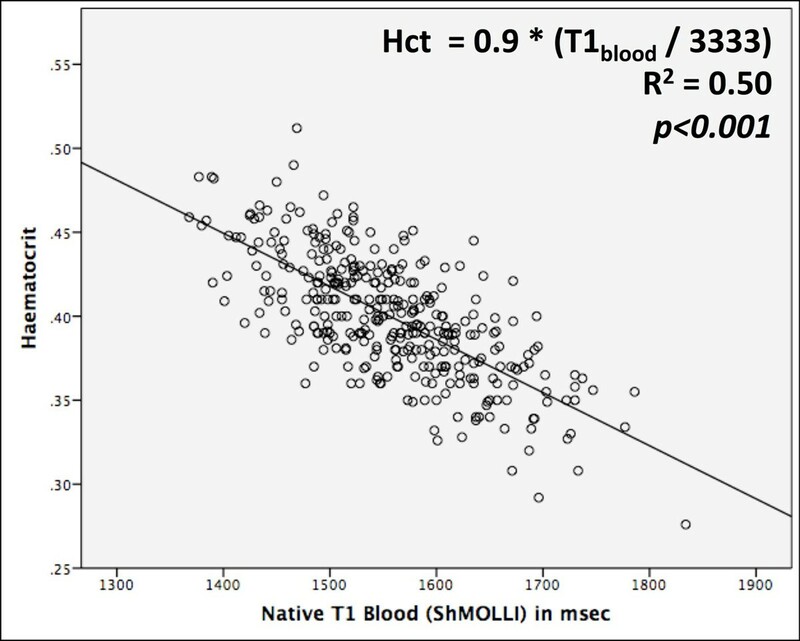 There was strong correlation between ShMOLLI T1blood and Hct across health and disease with a coefficient of explained variation R2=0.50 (p<0.001; Figure 1), i.e. 50% variability of native T1blood apportioned to the Hct. The broad array of cardiac pathologies provided a wide range of Hct (40.0±3.6%; range 28-51%) and native T1blood (1557±81ms; range 1368-1834ms), with similar correlations of Hct versus T1blood in each group. The regression equation was: Hct = 0.9 - (T1blood / 3333). Correlation between hematocrit and native T1blood. Derived ECVNo Hct exhibited excellent correlation with conventional ECVHct (R2=0.99; p<0.001) with small ~2% bias and ~3% SD of differences on Bland-Altman analysis (95% confidence interval -0.7 to +3.9% excluding Amyloid, and -2.6 to +8.0% for Amyloid) close to previously reported 1.4% [Schelbert EB JCMR 2011, 13:16]. ECVNo Hct correlated equally well with clinical markers of disease severity (LV mass index, LVEF, stroke volume index, left atrial area index and NT-pro-BNP) as ECVHct and partition coefficient, and better than post-contrast T1myocardium (Table 1). Correlations between ECV with/without hematocrit, partition coefficient, post contrast T1 myocardium and clinical parameters. Native T1blood correlates well with the laboratory-measured values of hematocrit. Our data demonstrates that straight-forward derivation of hematocrit from T1blood can be used as an immediate measure of ECV that may pave its application for nearly instantaneous clinical diagnosis. It remains to be confirmed if the high correlation of ECVNo Hct with the conventional calculations may cause blood sampling to become an obsolete complication in clinical practice. TAT and MF are supported by doctoral research fellowships by the National Institute of Health Research (NIHR) and British Heart Foundation, respectively. SKP and MDR are supported by the NIHR Oxford Biomedical Research Centre based at the Oxford University Hospitals Trust at the University of Oxford.